CHEFsat (Cost-effective High E-Frequency Satellite) is a 3U CubeSat to test and prepare consumer communications technology for use in space. The growing range of devices, components and miniaturized technology available on consumer markets represents a boon for space exploration and cost management. CHEFSat specifically readies a consumer-grade radio frequency device for wider space use by testing its safety and effectiveness in a working CubeSat deployed from the International Space Station (ISS). CHEFSat will test new, emerging millimeter wave components in space. Low cost, high performance, reliable IC devices that operate in E-band are now readily available. The main mission objective is to better understand the effects of weather and atmospheric conditions on E-band links. After ejection from the dispenser, CHEFSat will be in low power mode for 45 minutes. At the 45 minute mark, CHEFSat will deploy the S-band telemetry flip-out patch antenna and the UHF folded dipole antennas. The bus will remain in low power tumble mode until first contact over the ground station. CHEFSat will be commanded to de-tumble. 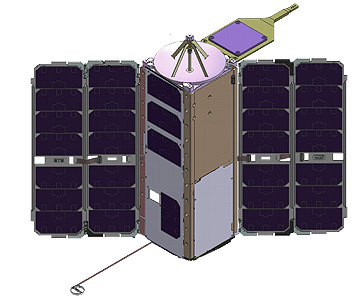 Once the tumble rate drops below an acceptable level (<1° / min), CHEFSat will be commanded to deploy solar panels during the next available ground station contact. Once deployed, CHEFSat will enter into coarse sun-pointing mode to increase power generation. Post deployment, spacecraft checkout activities will commence to verify the functionality of the remaining subsystems. Once the bus systems have been verified, the payload checkout activities will begin. A reflight, CHEFSat 2, was launched on board of the Cygnus CRS-10 cargo mission and was deployed from the spacecrafts external deployer after departing from the ISS.